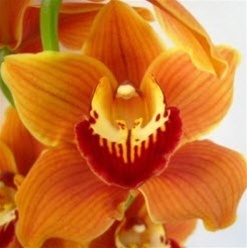 Orange Mini-Cymbidium orchid flowers are a smaller version the classic Cymbidium. They have 8-12 blooms and will add an exotic flair to your wedding bouquet, centerpiece or flower arrangement. Free shipping!